Termite Issues? Multipest are Brisbane's Most trusted Termite Treatment Company. Call Now To Speak To An Expert. Here a few steps to take to ensure your home is safe until your local professional arrives. First thing to do is call Multipest your local professional. Don't bother them. If you have found what you believe to be Termite issues, leave them, cover the light up (with some tape) and call. Don't go looking for more. We will do a full inspection of your house once we're there. CALL (07) 3390 1353 for further advice or to book in an inspection. Termidor® HE Residual Termiticide now available in Australia, provides a more even stable treated zone. Termidor HE allows on average 30% less trenching, less than half the drilling, and provides increased customer satisfaction. - Termidor HE gives your Accredited Applicator more flexibility to provide a superior treatment without cutting corners, disturbing the structure or damaging the aesthetics of your home. - Termidor HE provides increased movement through soil, resulting in less drill holes especially in those tiled areas. Why Choose Exterra Termite Interception & Baiting System? Multipest is proud to be Queensland's premier authorised preferred company for Exterra and we have a strong partnership with Exterra. We are excited to be able to offer an environmentally responsible option for treating termites with the Exterra system. $250,000 manufacturer's timber replacement warranties available on most homes. Read more on Exterra here. Why Choose Sentricon Always Active? - Sentricon offers the customer safety of a professional or self monitored baiting system and the continuous protection of a chemical barrier. - Sentricon requires no drilling, digging or disruption to your home. - Sentricon is safe for your family, pets, and the environment. Multipest offers a range of options with Sentricon including complete DIY baiting systems or site specific targeted baiting. HomeGuard is the only physical termite barrier that has been offically registered by the Australian Pesticides & Veterinary Medicines Authority. HomeGuard is the only physical termite barrier proven to block, repel and kill on contact all of Australia's subterranean termites - the triple whammy! And what's more, it will go on stopping, repelling and killing termites for the long term. With annual termite inspections, HomeGuard will continue to deliver peace of mind. HomeGuard is ideal for any pre-construction or renovation needs and is ideal for all builders, bathroom renovators etc. Altis is a patented reticulation system designed to treat the area under concrete slabs, for protection against subterranean termites, and the area around the external perimeter of structures to prevent termites from entering the outside of the building. Altis is installed prior to any concreting, paving etc. Altis is ideal for external pathways, driveways and patios added on to existing homes. 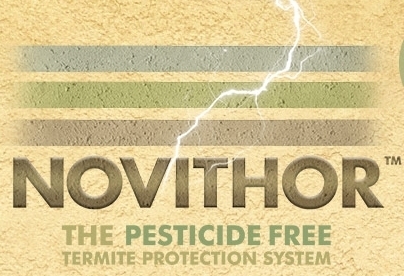 The NOVITHOR System consists of three pesticide free elements which, in combination, ensure any construction type can be securely protected. Australian Standards recommend that your termite inspection is conducted every year and includes a visual subterranean termite inspection at your home. This inspection can save you thousands of dollars in damage repair costs. In South East Queensland 1 in 3 homes will be attacked by termites, causing more damage than fire or flood. Your general house insurance policy does not cover termite damage and if undetected the subterranean termite can cause extensive structural damage to your home. Annual termite inspections and/or a termite preventative treatment will give you peace of mind and help ensure the security of your largest investment, not mention save you thousands of dollars in household repairs. Multipest is Queensland's premier accredited Termidor applicator. We make sure that we take into consideration the surrounds and environment before applying the treatment. All of our technicians are fully qualified and hold current Queensland Health Department licences - giving you peace of mind for the safety of your home and your family. $100,000 TimberSecure timber replacement or other warranties are available on most homes after treatment. The Australian Standards termite inspection takes 1 1/2 - 2 1/2 hours, depending on the size of the building and the property. A written report (including recommendations) is supplied for each inspection.